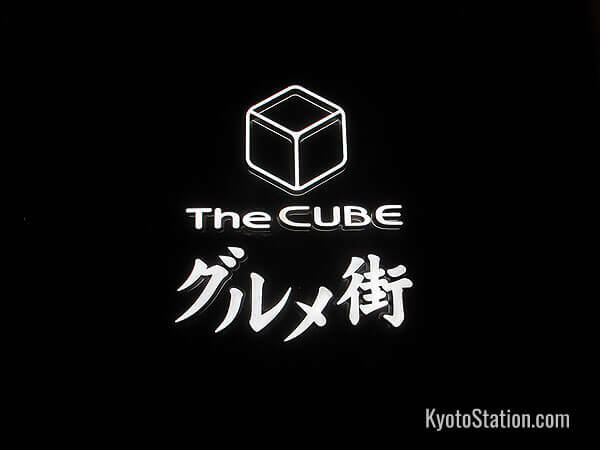 The Cube Gourmet Street is situated on the 11th floor on the west side of the station building, south of the “Daikaidan” Grand Stairway. Here you will find nine restaurants each with their own specialty. 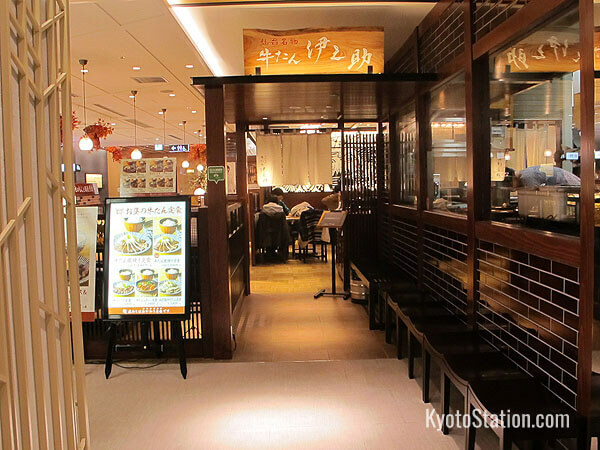 Though there is a Chinese restaurant and a Kyoto style spaghetti restaurant too, most of the restaurants here serve Japanese cuisine such as tonkatsu, okonomiyaki, kushi katsu, and noodles. 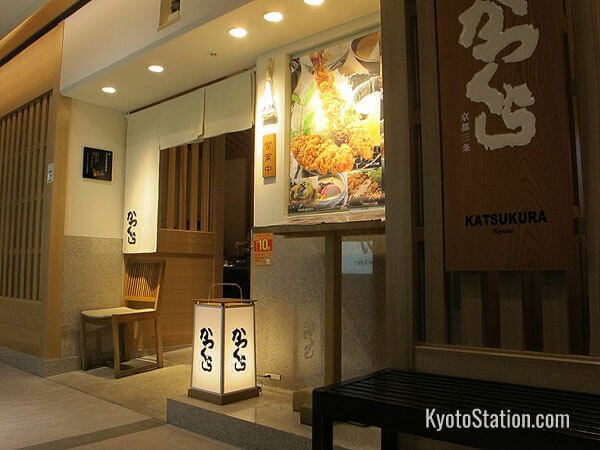 Katsukura is an extremely popular chain of tonkatsu restaurants based in Kyoto. The tonkatsu, deep fried and breaded choice cuts of pork, are served with rice, miso soup and freshly shredded cabbage. Katsukura’s tonkatsu is famously crisp and juicy, and its tonkatsu sauce and salad dressing, both made to a secret recipe, are renowned for their tastiness. If you are especially hungry, extra servings of rice, soup and cabbage are free. 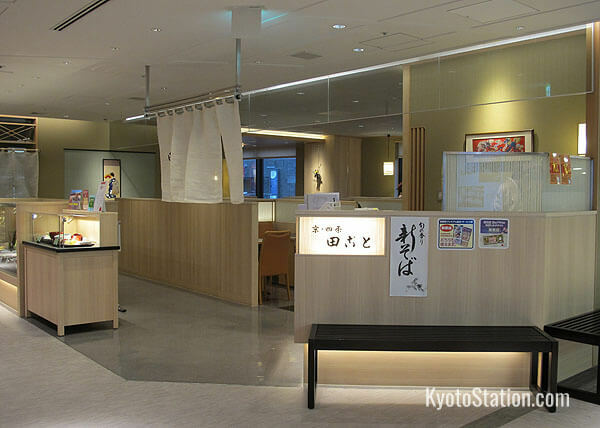 Tagoto is an old Kyoto restaurant chain that specializes in soba buckwheat noodles, crispy tempura, and Kyoto’s own special variety of sushi. In the days before refrigeration, raw seafood was hard to get in Kyoto, as it is quite far from the sea. Some fish varieties were pickled and carried over the mountains. Long strips of pickled mackerel placed over rice and then sliced into separate portions are called sabazushi, or mackerel sushi. 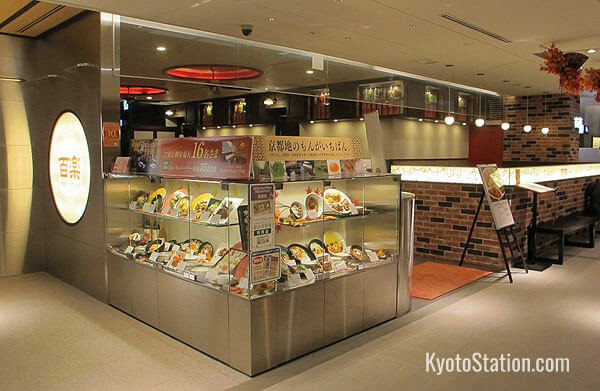 Please give this traditional Kyoto sushi a try if you come to Tagoto. Nishiki Warai specializes in savory pancakes called okonomiyaki, and other dishes that are cooked on an iron griddle and collectively called teppanyaki. 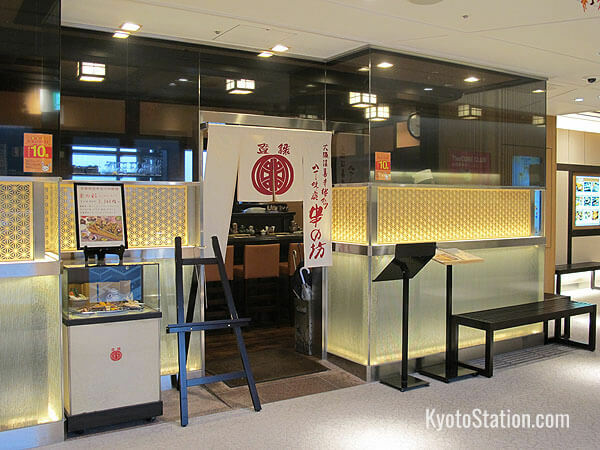 You can choose your own ingredients for the egg and flour based okonomiyaki pancakes, or try other items on the menu: fried shrimp, steak, or yakisoba noodles. 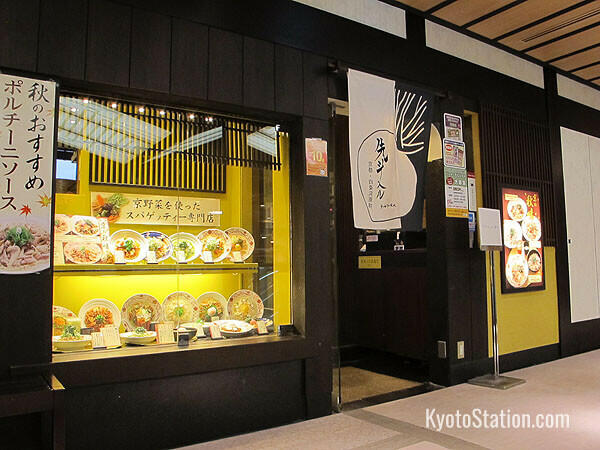 This is a branch shop of the original restaurant which is situated on Kyoto’s famous Nishiki food market. A Chinese restaurant serving both traditional and modern dishes that can be ordered a la carte or in economical sets. Among the items on the menu are chop suey, sweet and sour pork with chestnuts, “mapo tofu” (a hot pot of tofu and peppery minced meat), and that spicy Sichuan standard: Bang Bang Chicken. 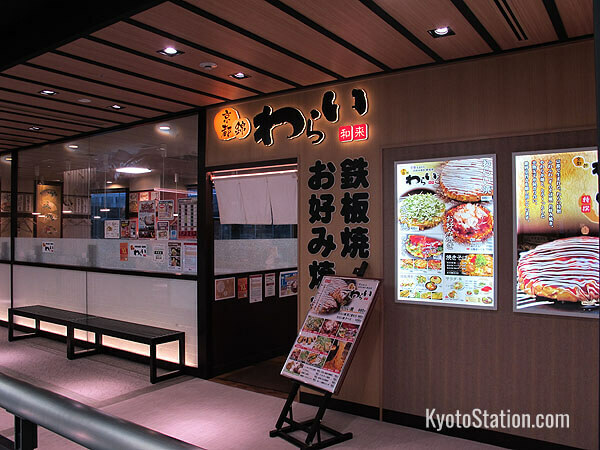 This store specializes in kushikatsu, skewered and seasoned grilled meat and vegetables which are served with a choice of relishes: ponzu sauce, Worcester sauce, salt or mustard. The Kushinobo chain was established in 1950 and prides itself on selecting the very best seasonal ingredients and complementary beverages. 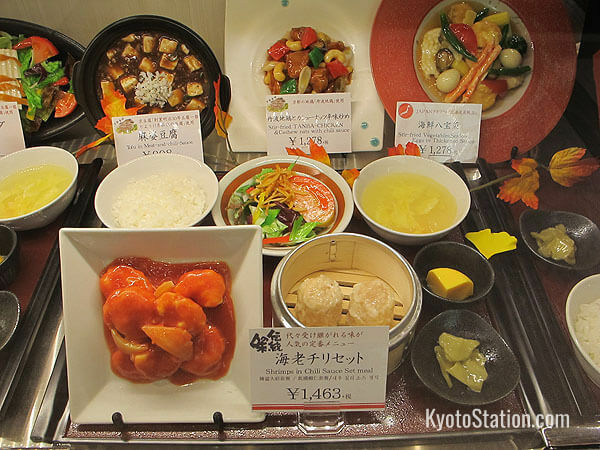 Eijuan specializes in the traditional Kyoto cuisine called misozuke: fish, chicken and pork pickled in miso paste. This is served with rice cooked in a large earthenware pot, and various seasonal side dishes. 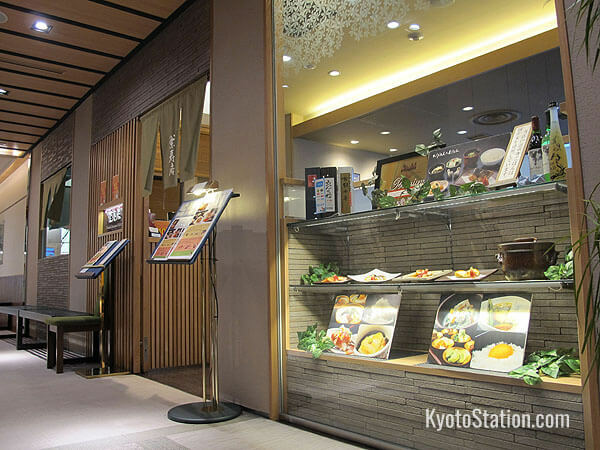 Kitchen Gon serves meaty meals that are considered “Western,” such as hamburgers, steaks, and beef cutlets. Their original specialty though is a massive dinner plate called “pinerice” (pronounced pee-ne-raisu) which consists of fried rice with deep fried breaded cutlets and curry. 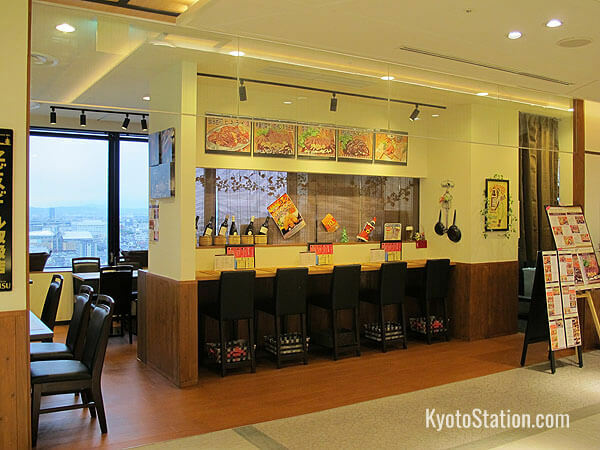 This is a Kyoto style spaghetti restaurant with a heavy emphasis on Kyoto’s famous vegetable varieties, such as sweet and juicy kujonegi scallions, or delicately flavored kamonasu eggplant. The seasonal menu features local produce in innovative combinations of traditional Japanese flavors with popular Italian pasta. Gyutan Inosuke will initiate you into the sacred mysteries of Sendai style grilled meats and in particular that most esteemed northern dish: gyutan, or char-grilled beef tongue. Beef stew, various appetizers and a varied selection of complimentary Japanese beverages such as nihonshu (sake), and shochu (a drink distilled from rice, barley or potatoes) round out the menu.